As you immerse yourself in the wonders of these natural healing and cleansing ingredients you will feel rejuvenated from the combination of healing salts. Studies have shown that magnesium and sulfate in Epsom salt are both readily absorbed through the skin, making your Chocolate Salt Bath an easy and ideal way to enjoy amazing health benefits. Magnesium plays a number of roles in the body including regulating the activity of over 325 enzymes, reducing inflammation, helping muscle and nerve function and helping to prevent artery hardening. Sulfates help improve the absorption of nutrients, flush toxins and help ease migraine headaches. 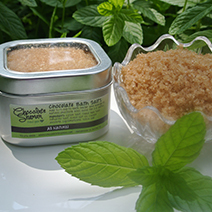 Indulge, heal and rejuvenate as you treat yourself to this wonderful Chocolate Salt Bath!